Since I am sliding firmly into my 40’s at 41, the skin around my eyes fights to stay well hydrated. 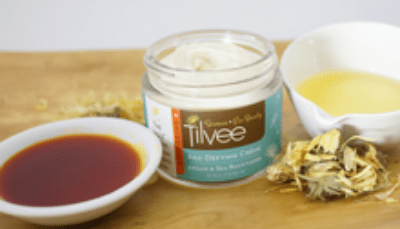 I adore Tilvee products, especially the age-defying cream with argan & sea buckthorn. All the ingredients are purposefully chosen for their clean and effective properties. The lovely scent is barely there, and more important, the texture is creamy decadence that absorbs into the skin leaving behind a silky smoothness. A little bit of TLC is always a luxury. Treat yourself right. Loves, hugs, and Peanut butter!